White Stilton with redcurrant, candied orange peel and Cognac. 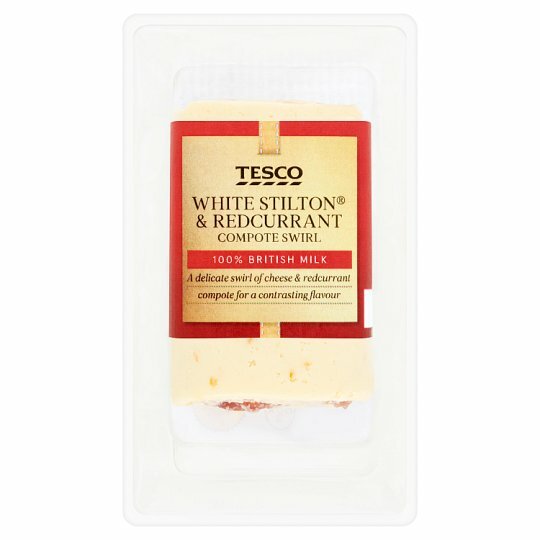 INGREDIENTS: White Stilton Cheese (Milk) (64%), Sugar, Glucose Syrup, Redcurrant Puree (5%), Water, Cognac (2.0%), Orange Peel (2.0%), Cornflour, Glucose-Fructose Syrup, Gelling Agent (Pectin), Acidity Regulators (Citric Acid, Trisodium Citrate), Colour (Anthocyanins), Firming Agent (Calcium Lactate), Flavouring. Keep refrigerated., Once opened, keep refrigerated and consume within 3 days and by ‘use by’ date shown.